Ever since human embryonic stem cells (hESCs) were first cultivated by Dr. James Thompson at the University of Wisconsin, Madison in 1998, they have been at the centre of one of the most promising, and at times controversial, areas of modern medicine. Recently hESCs have begun to live up to their early promise, as I discussed in a recent post on the launch of a clinical trial of hESC-dericed retinal cells in restoring vision in Stargart’s Macular Dystrophy. Gerbils were used in this study rather than the more usual mice because they hear sounds in the same frequency range as humans, whereas the hearing of mice functions best at higher frequencies. 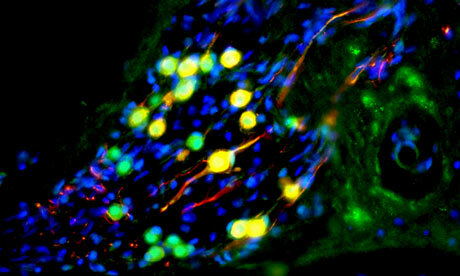 Human ESC derived optic nerve cells (yellow) repopulate the gerbil cochlea. Credit: Marcelo Rivolta, University of Sheffield. You can read more about the work on the University of Sheffield website, where Dr. Rivolta has published a discussion of his groups work. It will be some time before this approach can be evaluated in human trials, as further animal studies will need to be undertaken to both improve the efficiency of the procedure so that greater improvement to hearing results, and to demonstrate efficacy and safety over longer periods of time (this study lasted only 10 weeks). It is also clear that this technique will need to be adapted to address the different causes of deafness, for example deafness may be due to damage to sensory cells, or to the auditory nerve that passes the message to the brain, or to both. There’s no doubt that this is an exciting piece of research in its own right, and of course another example of how the field of stem cell research is maturing, but what’s also been very refreshing is how Dr. Rivolta and his colleagues at the University of Sheffield have been will to discuss their use of animals in research with the press, with reports appearing in numerous outlets including the BBC, Guardian, ABC news, Times of India, Fox and Montreal Gazette. It is further evidence – if any is still needed – that when scientists are open about their use of animals in biomedical research they will find that there are many journalists and news editors do understand the value of such work, but it is equally certain that in order to report animal research accurately journalists need scientists and scientific institutes to engage with them and provide the detailed information to inform their articles. The message to the scientific community could not be any clearer; if you wish the public to understand your work, take the time to explain it to them. Posted on September 14, 2012 October 15, 2012 by EditorPosted in News, Science NewsTagged animal research, auditory nerve, cochlea, cochlear implant, deaf, deafness, gerbil, hair cell, hearing, hearing loss, hESC, human embryonic stem cell, Marcelo Rivolta, neuron, sensory cell, stem cell, surgery, University of Sheffield. Next Next post: Why Should We Respond to Internet Activists?